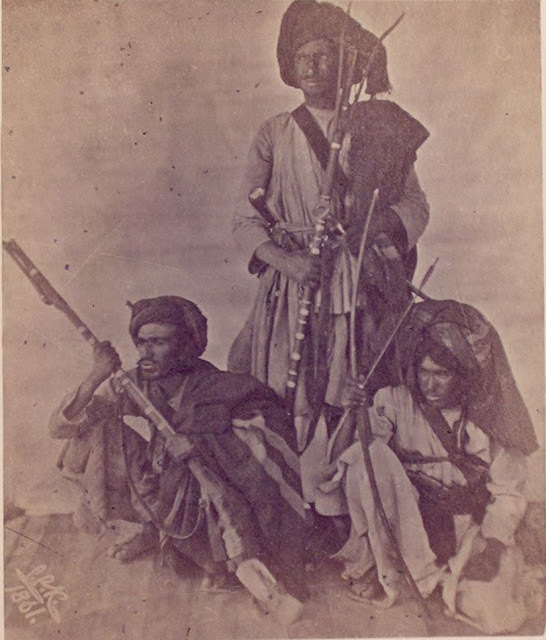 The Barak clan belongs to the Tari division of the Khattaks, descended from the Yasinzai sub-division. They occupy the Barak Tappa. 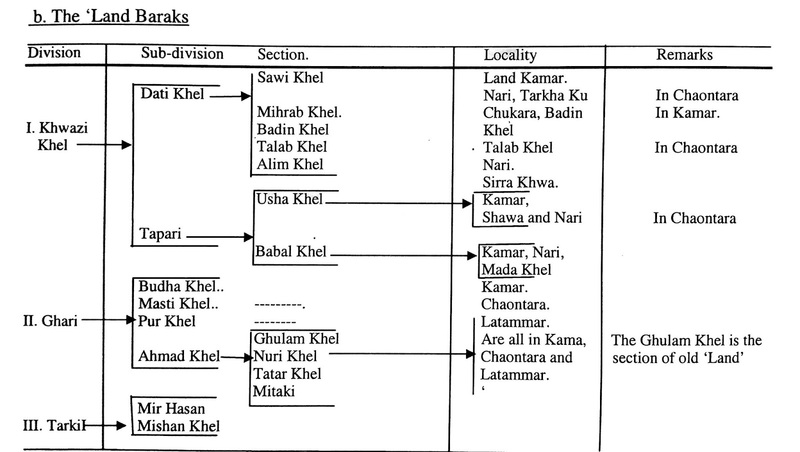 This tract is bounded in the east by Shakardarra and the Isa Khel Tehsil of Mianwali district and in the south and west by the Wazirs and Bannu district. 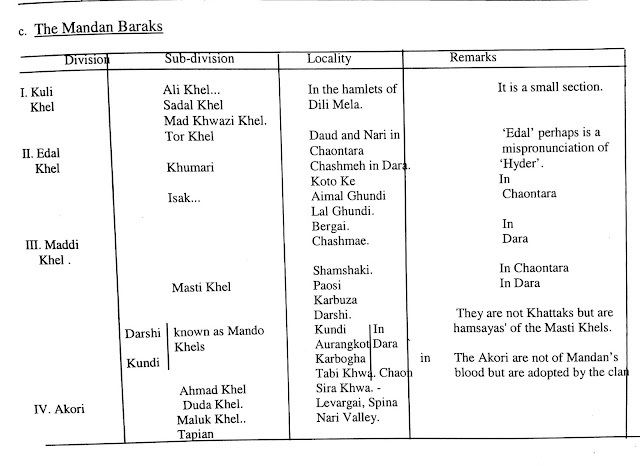 The Baraks were managed by the ' Khans' of Teri. Prior to the annexation they were more independent of their 'Khans' interference and did not pay them revenue without a fight. 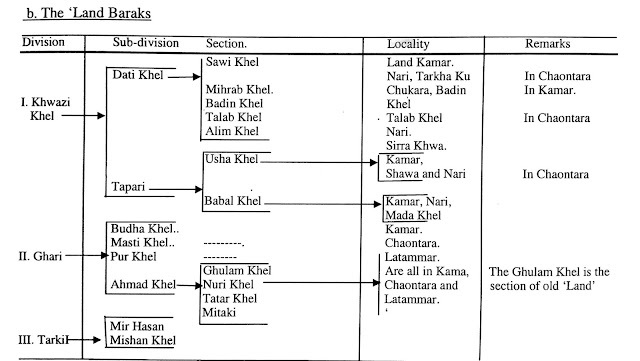 They fought Saadullah Khan of Teri and Shahbaz Khan at Nari, near Karak in the Kun-i-Gai pass and on the banks of Nari in the Land-Kamar area between Surati kila and Khwari Kila respectively. The ruins of their forts at Jandari and Shah Bazgarh still exist. 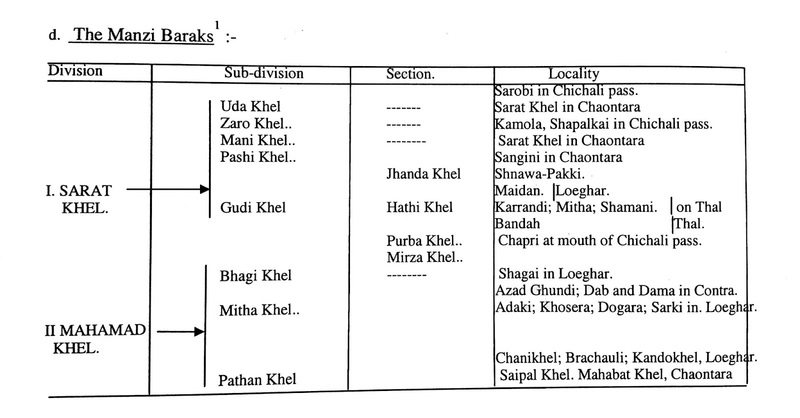 The Baraks possess lands in the Daresh Khel, Bahadur Khel and Latammar tracts, the valley of Nari, the whole of the Chaontara tracts, the Loeghar hills and the country of the Gudi Khels between the Spinghar and Shinghar ranges. They also hold the tract of Land-Kamar. Their boundary runs northwards from Latammar to Daresh Khel and to the north-eastwards to Daud Shah Banda and thence eastwards down the valley of Teri Toi to Landa Manzi and from there to Dand of the Edal Khels and to the function of the Khattaks nullah with the Mithan tract. From this point it runs south up to the Khattak nullah watershed near Mitor and south-west along the Chichali pass to Chapri, at the mouth of the pass. In the west and south-west of the Chichali pass the Manzi and Gudi Khel hills also belong to the Baraks that run south dividing the Wazir and Marwat territory in the west and that of the Niazis in the east. On the Tal, west of the point where the Loeghar Toi leaves the Manzi country hills, the Baraks have Land-Kamar and the country north-west to Latammar. The Barak clan is divided into four divisions , namely, the Uzshdah, Land, Mandan and the Manzi divisions. 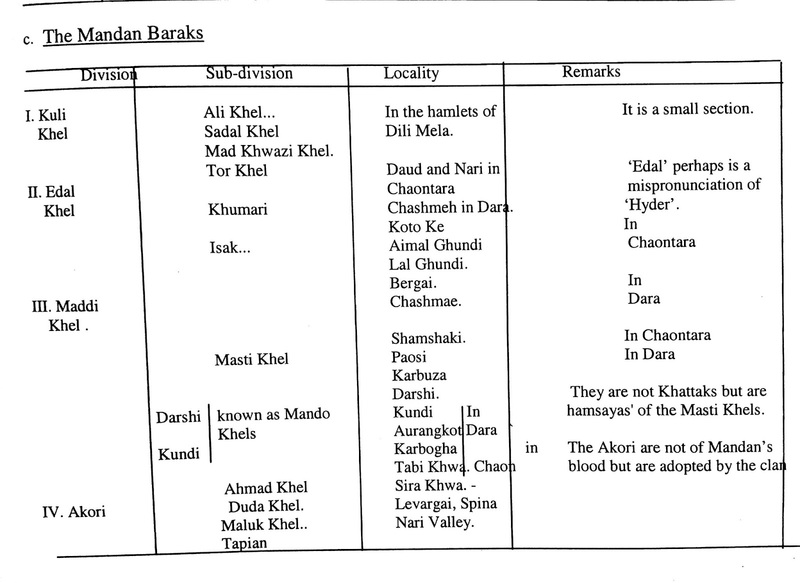 Some of the sections of the Barak Taris are bracketed into two groups , the Uzshdah Baraks and the 'Land' Baraks. 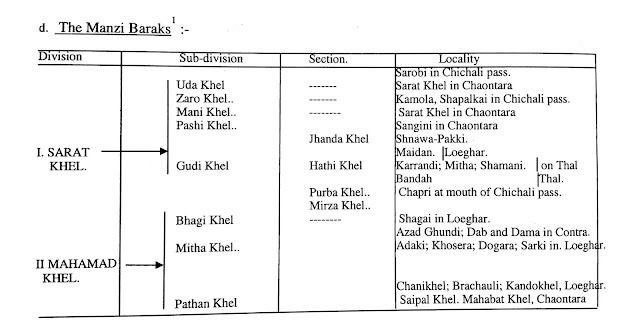 This grouping of the sections , probably does not follow any genetic lineage , rather is based on a legend. The word 'uzshdah' means long , while 'land' means short . 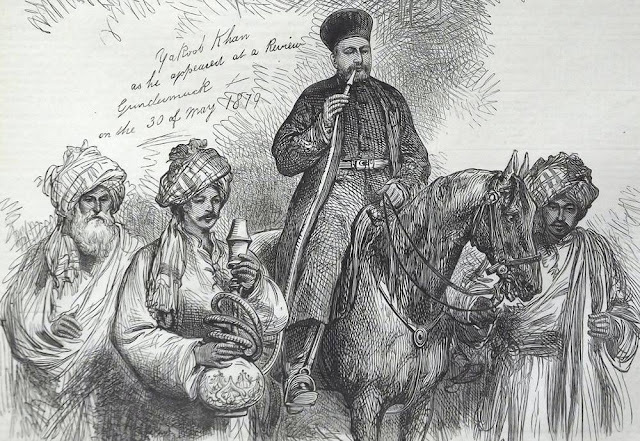 It is said that once the sons of Ismail (grandson of Barak) met a pious Faqeer , Suraz Khan. Each one of the two brothers gave a cow as an offering to the Faqeer. The Mashi's cow was healthy , with a long tail and of a rich 'Khaki' colour. The 'Faqeer' was pleased , accepted the offer and said, "Mashi has brought the Khaki. Let a large company of men follow him"..... The Tarki's cow was small and had a cut tail and was thus blemished . The Faqeer in taking the offer said, "tarki has brought a cow with a tail cut short , Landa. Let a small band of men follow him". Since then Tarki was called 'Land' for his 'Landa' cow while Mashi was called 'Uzshdah'. To this day the Uzshdah are said to be more numerous than the three branches of the 'Land' and in their old tribal feuds the 'Land' generally suffered the most.